Our outdoor enclosures are the ideal waste bin for public spaces schools, lobbies, waiting rooms, shopping and conference centres. They combine the tough, durability of stainless steel with an attractive, modern design that looks great in any setting. Ecobin’s outdoor enclosures come with large, tamper-proof and highly visible side panels that house bespoke signage or graphics. You can choose from a range of pre-designed, colour coded signage side panel inserts for different waste streams. Alternatively, you can send us your own design and we can make inserts up to order for your own personalised outdoor enclosure. It can sometimes be a daunting task, walking over to a range of waste bins and not knowing whether you are putting the right material in to the right waste bin, so our outdoor enclosures work perfectly to encourage people to increase their recycling and be more aware of where their waste is going, knowing that there is a good chance that what they are putting in to the waste bins can be recycled. Our outdoor enclosures are bright in colour so that they are easy to see and identify what type of recycling they are. The outdoor enclosures also have magnetic side panels that can be used to include a list or graphics of what to include and exclude from the specific outdoor enclosure. These magnetic panels can also be custom made to suit any area. HOW DOES THE OUTDOOR ENCLOSURE WORK? Ecobin’s outdoor enclosures are an easy to use, attractive addition to any public area. Simply place your wheelie bin underneath the enclosure and close the door. The outdoor enclosures are made from quality materials designed to withstand the extremes of Australia’s seasons and also have an optional rain hood, made from stainless steel. The magnetic strip on the outdoor enclosure specifies what materials can go inside the bin, as does the bright colours on the outside. This makes it easy for people to identify the recycling stream right away. Once your outdoor enclosure is full, you simply open the enclosure and wheel your bin out so that it can be taken away to your nearest recycling facility or landfill. All materials that go inside our waste bins need to be separated at the source so that they can either be sent to our nearest recycling plant, or to the nearest landfill. 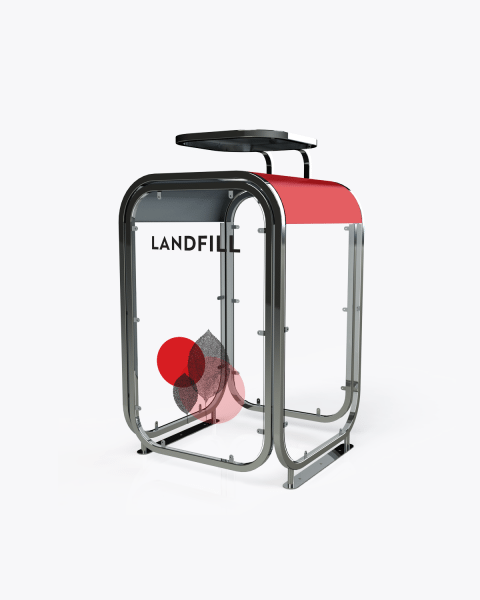 It is important to only place the correct items in your outdoor enclosures as contamination (placing the wrong type of material into the bin) can actually have a huge impact on the recycling process and can even cause an entire truckload of recycling to be sent to landfill, putting all of your hard recycling work to waste. To ensure that your outdoor enclosures are being used correctly, ensure you educate your users in the correct use of the outdoor enclosures. You can do this by placing the magnetic strip on the side of your enclosure, specifying what material goes in each bin. WHAT CAN I PUT IN THE OUTDOOR ENCLOSURE? It is important to encourage users to look at the materials that can and cannot be placed in to the outdoor enclosures before throwing it in. Ecobin’s outdoor enclosures are made from quality materials designed to withstand the riggers of daily use and the extremes of Australia’s seasons. 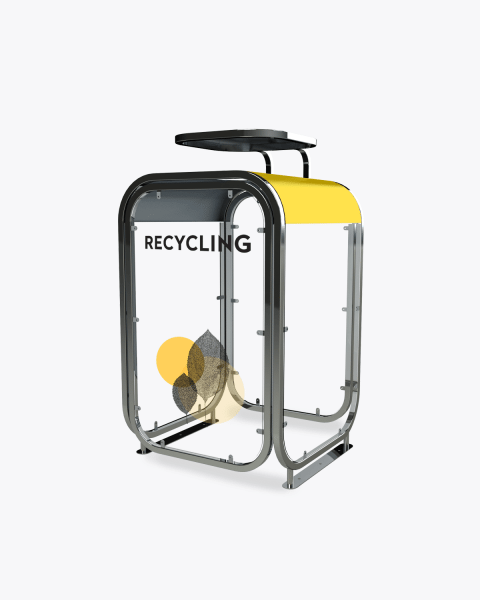 Ecobins are tough and designed for reuse. Whilst committed to creating a beautiful wheelie bin enclosure that would reflect a more refined solution and disrupt the sea of common styles we also wanted to ensure we supported the Australian manufacturing industry. Thanks to quality fabrication we have been able to do just this, and still honour the attention to detail necessary for smooth and easy functionality up for the challenge of everyday use.